President Elizabeth (Beth) J. Stroble and Julian Schuster, provost, senior vice president and chief operating officer are pleased to announce the appointment of Professor Rick Rockwell to Associate Vice President and Chief Communications Officer for Webster’s Global Marketing and Communications (GMC) unit. This appointment is effective immediately. “As Webster University enters our second century, we welcome Rick Rockwell’s leadership as Webster University’s Chief Communications Officer," Stroble said. "His career accomplishments are notable, including the past two years of leadership as Associate Dean in Webster’s School of Communications; academic experience at American University and Northwestern University; and significant industry experience in journalism, including roles as executive producer, general manager, managing editor, bureau chief and reporter. His positive relationships with members of our community and his academic perspective provide a strong base for advancing Webster’s mission locally and globally,” she said. 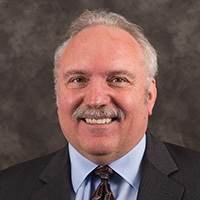 "We are grateful for Rick’s willingness to serve when needed and look forward to working with him and GMC to further strengthen Webster’s external and internal communications in ways that advance the institution’s mission. I am confident with his background in the School of Communications that Rick understands how to promote our academic programs," Schuster said. GMC works to promote Webster University's mission, position and goals through the development and creation of effective communications, both internally and externally. GMC tells the stories of the diverse, interesting and accomplished students, faculty and staff who thrive in and contribute to Webster's premier global network for learning. The GMC unit consists of four departments: Creative Services; Digital Marketing & Communications; Public Relations; and Strategic Communications. “I have very much enjoyed my work with the GMC team this summer in an interim role and they have inspired me through their creativity and esprit de corps to accept the challenge of guiding this important part of the University going forward," Rockwell said. "I also look forward to maintaining my strong ties with the wider University community to help inform my work with GMC. I believe GMC can build a dynamic network of collaboration both within the University and within the communities that the University touches with its global network of campuses. And I will work with my new team and all Webster colleagues to bring the University the recognition it deserves for its positive contributions to those communities through its academic programs and other intellectual and artistic works," he said. As associate dean of the School of Communications since he joined Webster in 2014, Rockwell has been charged with special initiatives, including graduate studies and online programs, as well a working with Webster’s metropolitan and military campuses. Involved in curricular developments, he has also provided administrative oversight for the School’s external media and student media organizations and publications, in addition to supporting other strategic activities of the School of Communications. While associate dean, Rockwell collaborated with colleagues to grow graduate enrollments, establish new certificates in Latino media studies and production, create the first multimedia production degree in more than 18 years, direct the redesign the School of Communications’ website, refresh graduate advertising and marketing, and increase diversity of graduate program instructors. Rockwell came to Webster after 17 years with American University in Washington, D.C. At American University, he created the inter‐disciplinary international media program, a graduate joint degree program taught through both the School of Communication and the School of International Service, the university’s top‐ranked school of diplomacy. He went on to direct that program for the School of Communication. As interim director of journalism programs at American University, he also led curriculum reform efforts that resulted in the first major reforms of the graduate‐level journalism curriculum in a generation. Rockwell is the co‐author of “Media Power in Central America,” which won a national Choice Award from the American Library Association, among other accolades. Rockwell is also the executive producer and host of the weekly online radio program “Latin Pulse,” which is distributed via Link TV and goes out to more than 130,000 online subscribers weekly. He has worked as a producer for ABC News, a freelance reporter/producer for the PBS NewsHour, and a senior producer for Discovery Communications. Rockwell has extensive experience as a reporter, producer and news manager at various television outlets, ranging from Texas to Wisconsin and Florida, including serving as the managing editor at WTSP-TV in St. Petersburg, Florida. Rockwell earned a BSJ in radio‐TV journalism from Northwestern University and holds an MA in international journalism from the University of Southern California.